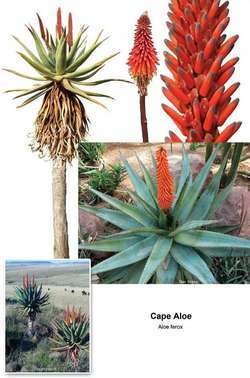 Originally from South Africa, now also in Southwest U.S.A. , this is a much larger, more aggressive plant than Aloe Vera, sometimes having a stem reaching over 12 ft high (4m). The leaves have bigger thorns, and hold 20 times more bitter sap. Has a red flower stalk. Famous for it’s laxative properties, has fiber, stimulates peristalsis, soothes, cleanses and detoxifies toxic poisons from intestinal tract, relieves inflammation. More polysaccharides, vitamins, minerals and amino acids than Aloe Vera. Helps stimulate white blood cell production, heal wounds, inflammation and skin issues. Good for detoxifying old crap from bowels and body. Used for eczema, dermatitis, psoriasis, genital herpes, seborrhea, red eyelids, gums, ulcerative colitis, lung cancer, lowers blood sugar in diabetics, tightens skin, high antioxidant, contains aspirin-like compounds for pain relief. May cause some cramping as it works on intestines. Do not take while pregnant.